Jazz and improvised music has a rich history of giving a voice to the bold and the rebellious. 'Jazz is the big brother of revolution', so said Miles Davis. 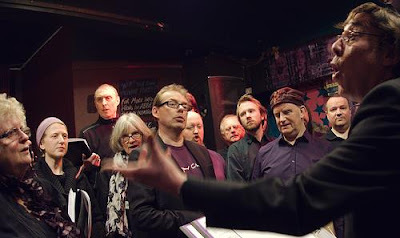 Well, Sheffield's premiere anti-choir Juxtavoices did their bit for the rebellion recently by being ejected from the Wirksworth Arts Festival midway through their performance. Juxtavoices were ejected en masse from St Mary's Church 1 hour into our 3 hour performance at this years Wirksworth Festival! The performance was halted by the church on the grounds that the visual artists with whom we were sharing the space felt our music was "too challenging" and was preventing people discussing their visual works, and that some members of the public were disinclined to enter the space. This despite the fact that plenty of people were sitting and listening, and enjoying the performance. And all this despite us having paid to book the space for the afternoon.